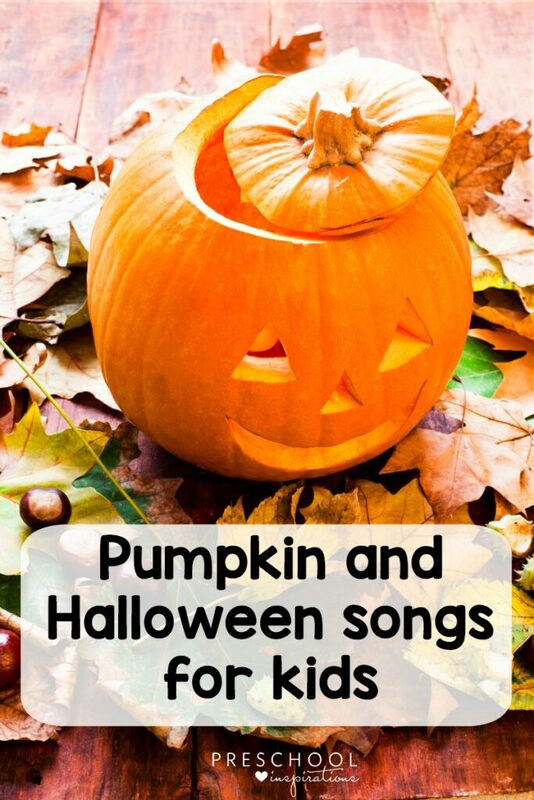 Get some of the best pumpkin songs and Halloween songs for kids to use for preschool, toddlers, and beyond! Music is one of the best teaching tools there is! There is lots of scientific research showing how music actually makes children smarter. A singing child is a happy child, and when you have a full class of children, that can be priceless! There always comes that time when you need some fresh tunes. Holidays and seasons provide a great opportunity to switch up your musical rotation and add some new songs to the mix! Whether you’re using songs in circle time, for transitions, for a brain break, or for some fun at home, there’s bound to be a themed song that will fit the ticket. Fall is an especially rich time, because there are lots of both pumpkin songs and Halloween songs to choose from! From traditional and well-known pumpkin and Halloween songs to new and inviting Halloween rhymes, chants, and dances. This adorable pumpkin song is a classic! It’s a perfect Halloween song for kids. This version includes some (very cute!) witches and lyrics as well. If you are looking for those 5 Little Pumpkins without a witch, here’s a great song! My preschooler is singing this non-stop right now and loves acting out the different emotions. It’s a great pumpkin song to sing at Halloween or any time of the year. Patting and clapping to a beat is such a great skill! This adorable Halloween chant, which mimics the popular “Who Stole the Cookies” game, is sure to give your kids lots of gross motor practice, and they’ll love the silly characters. It’s a perfect chant to learn and say with your kids without the video, too! This is a really great Halloween rhyme not only for toddlers, but for older kids too! Be sure to have your remote handy to pause the video so your kids can guess the answers when he asks a question. Those 5 silly pumpkins are at it again! Enjoy this version of the classic preschool chant, “5 Little Monkeys Jumping on the Bed.” It’s one of the only preschool pumpkin songs out there that isn’t Halloween-themed. Are your kids as obsessed with Baby Shark as mine are? I confess that I actually love that little song! Here’s an adorable holiday version that is a perfect Halloween party song, or would be a great Halloween circle time song as you make up your own costumed sharks. Another great Halloween song for preschool! The video is cute, or you can also just turn on the audio to hone those critical listening skills. Your kids will love dancing and acting out the different movements. I love it when they take classic songs and turn it into great Halloween music for kids! This catchy tune is sure to keep your kids’ attention. This one would be a great Halloween party song, too! Another great pumpkin song for preschoolers! (Let’s face it, I love most everything from Super Simple Learning!) Their songs are just so sweet and friendly and age-appropriate. Go Away is a simple kids’ song that’s great for Halloween time, bed time, or any time you need to tell something scary to “go away!” My own kids sing it to shadows in their bedroom at night time, or it’s great for combatting those pesky monsters under the bed. I always love the chance to reinforce letters and letter sounds, and this wonderful Halloween-themed chant is a great tie-in to your literacy unit. Here’s another great kids’ song for Halloween! I love the social-emotional growth aspect of identifying the different pumpkins’ emotions, and your kids will have a blast making the different faces. What Halloween songs list would be complete without the classic Monster Mash? It’s the original Halloween party song! Your kids will have a great time listening and dancing along. And it is perfect to go along with monster books! If you need more pumpkin ideas, be sure to check out our puffy paint pumpkins, book character pumpkins, or simple paper plate Jack-o-Lanterns.